The Customer account differentiates cash or retail customers from your regular customers. Cash or retail customers have no customer account so must pay for their orders immediately. The customer’s name, address and contact details. The currency in which they conduct their business. Their credit limit with you. Your payment terms and credit reference information. Accounts can be created individually or imported. 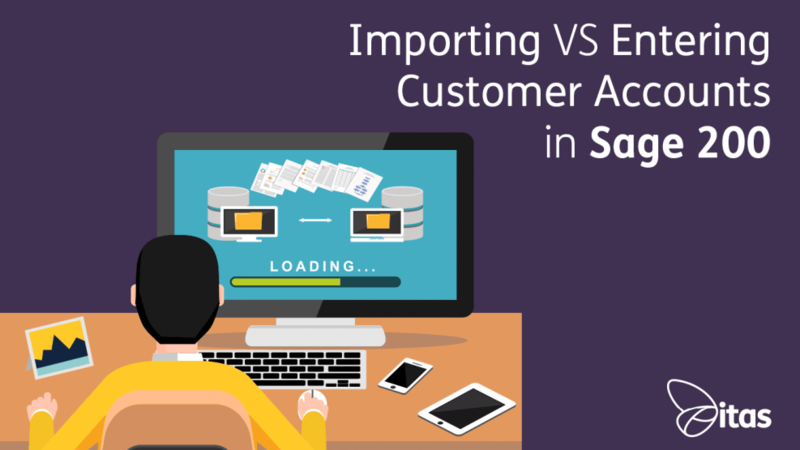 To speed up the customer account process you can import, in bulk, their details into Sage. Code – If you are adding a customer account, enter a reference for the customer. The account reference is assigned automatically if you have chosen Automatically Generate Customer Numbers in the Sales Ledger settings Options tab. To amend a customer account; select the code. Name – Enter the customers full name. Short Name – The short name is in addition to the customers full name. This can be up to 8 characters. Currency – The currency defaults to the base currency, set in Accounting System Manager. If the customer is in a different currency, choose whether the customer will use the Single or Period exchange rate. This only applies to currencies set up to use both single and period exchange rates. If you are amending customer details, you cannot change the currency. Company Details – Enter the customers address details in the company details section. You can use the City, County and Country boxes if you have selected to use segmented addresses on the Operational setting tab within Accounting System Manager settings. 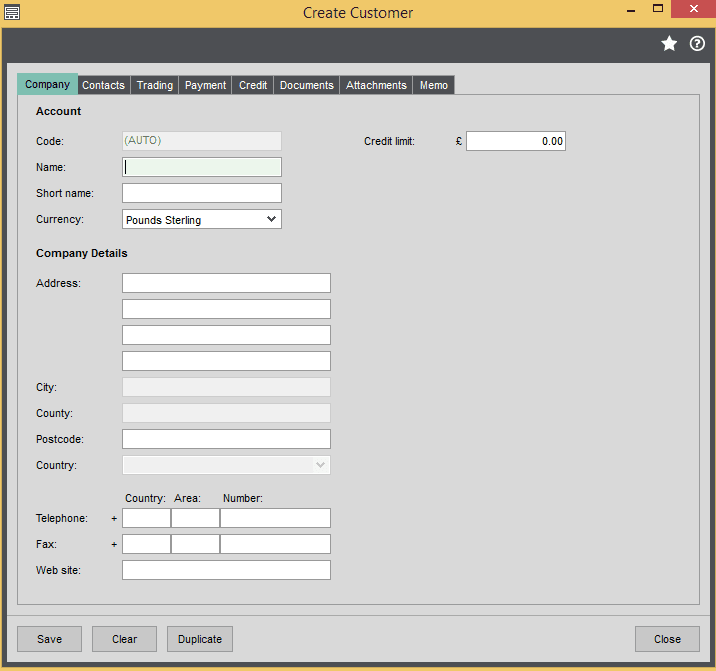 This allows fuller integration with Sage CRM. Use the Telephone, Fax and Web site boxes for your customers general information. You enter individual contact details on the contacts tab. The default contact details are automatically used on common sales ledger reports such as the Aged Debtors Report and on the customer list. Use the contacts tab to create a list of customer contact details; such as telephone number, mobile, fax, email address, website address and job role. Use the Trading tab to enter your customers VAT details, the default nominal account and the analysis codes. Use the Payment tab to enter or amend the settlement discount and payment terms for the customer. You also set the customer account type here. The Credit tab holds credit reference information for the customer. Use the Documents tab to specify the stationary layouts that you want to produce statements and invoices. You can also specify how you want to price items and send invoices to the customer. You can use the attachments to include information that is associated with an account or record in Sage 200 e.g. a document, image or spreadsheet. Use the Memo tab to add any comments that you want to make about the customer account. You may want to add reminders to other members of your business that should be taken into consideration when calling the customer (E.g. that you are currently in dispute over an order). You can mark these memos as Active so you can tell which memos are still being used. Setting a memo as Inactive allows you to keep a record of previous memos without deleting them from your Sage 200 system. 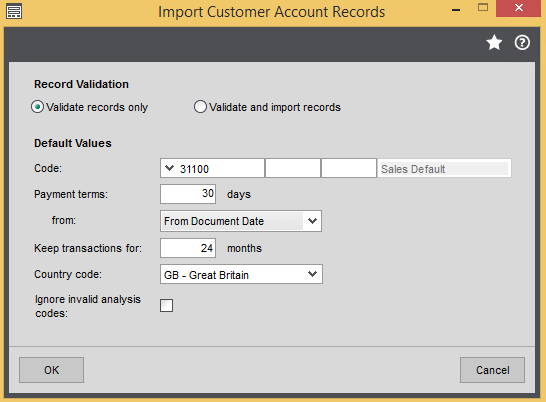 If you need to add a number of customer account records to your system, it might be quicker for you to import their details straight into Sage; using the default Sage imports. General account information such as company name, the country in which it is based and the currency in which it operates. Their credit limit with you, business terms and any credit reference details. You can import this information through a CSV example file, these would have been installed from the installation DVD or can be downloaded from the webpage. How to complete the CSV example file? Remove the example data, ensuring all headers are kept exactly as they are. Do not amend/edit or delete any headers. Additional detail can be imported using the optional columns on the import. It is important to remember certain fields cannot be amended once transactions have been posted to the account i.e. currency. Selecting ‘Validate records only’ will check the import file is compatible to import. Selecting ‘Validate and import records’ will check the import file and apply the data to the Sales Ledger. Once you have validated the records, validate and import records.